AWESOME WALL ART!!!! THE SUN AND THE MOON LOOK GREAT TOGETHER AND AWESOME ON MY BEDROOM WALL!!! THANK U OVERSTOCK.COM UUUUU DID IT AGAIN!!!!! 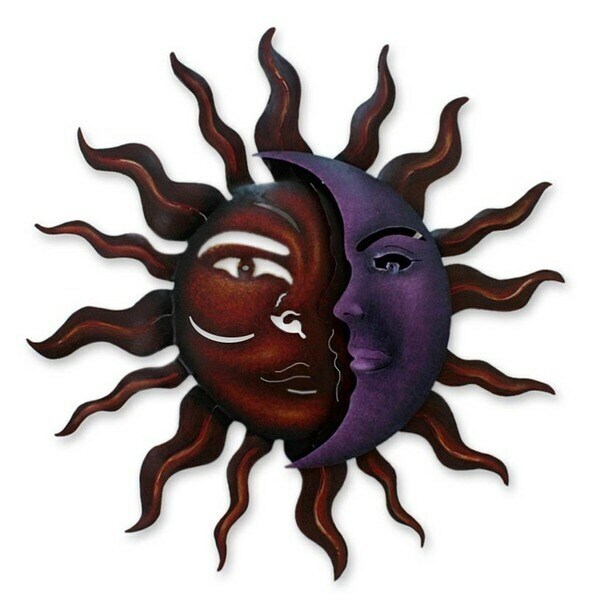 Cut, hammered, and painted by hand, this steel wall art from Novica features a charming sun and moon, entwined in a romantic display of color and shape. The piece is perfect for any home that utilizes south-of-the-border flair in its decor, and the vibrant colors will liven up any color scheme. The piece can be hung both indoors and outdoors. I first selected this piece and purchased Nocturnal Sonata as its companion. They compliment each other beautifully. The steel is precision cut and the intricacy of the eyes and all lines is impressive. The paint is of flat finish though very rich and bold. To reiterate others perception, the quarter moon is purple, shaded nicely and does not at all dominate the piece. I can assure wherever located in your home, visitors will be drawn to the calming effects and likely comment as to their beauty. As another reviewer stated, I only wish the pieces were larger but they are accurately sized as depicted. This item is wonderfully crafted and the finish exudes quality and pride of workmanship. Shipped from Mexico, it does take a little longer but is well worth the wait. was rather dull without a gold wall behind it. sent it back. ok product though. best to have on painted wall to make it pop. This is a beautiful piece of artwork; great design, sturdy material, nice sized. I cannot figure out why people are saying that it wasn't as 'blue' as the picture because the picture is clearly a vibrant purple & that is how the piece looks. The descriptions states there may be a variation in colors from item to item because they are handmade. Highly recommend this item if you are looking for something trendy & well built. My only complaint would be that shipping is slow. Absolutely no complaints on the item. Love this wall art. The colors are deep and gorgeous. Purple is my favorite color so I love that the moon is such a deep purple. I have it on a beige wall and the colors really pop. It was packaged quite securely and had no damage whatsoever. Very happy with it. I'd gladly recommend this! I just received my wall art and I LOVE IT!! This is one of the best I have purchased. The construction of this piece is sturdy and has a bit of weight to it. The back of it has a stand that lays against the wall instead of the art itself. The colors are very rich. I am a huge fan of moon, sun & stars artwork. Can't wait to hang this on my entry wall with the other six I have. My neighbors also compliment me on my wall. I was concerned about this piece arriving without any damage due to it's intricacy and detail. Additionally, I have never ordered from Out of Stock.com before. It arrived very well wrapped and in perfect shape. I absolutely love this piece in my office at work. My office is a drab color so I was looking for something that was both colorful but not and not tacky as well as being a conversation piece. This has turned out to be the perfect piece. It's two dimensional complexity is only further enhanced by the dramatic color choice and whimsical yet calm presence. Everyone comments on it that enters my office. Beautiful piece of art. It came from Mexico, delicately wrapped. Vibrant colors. Definitely a convo piece. It is metal, so it stands out against your wall. I was very pleased with the size and vivid colors of this 3-d wall art. This wall art is just BEAUTIFUL !!!!! Rich colors. Well packed. Well priced. Something peaceful about it. Beautiful. Perfect. So pretty I put it in the house. Love love love the color against my turquoise wall...it sounds weird but it really pops! Really nice piece! Nice quality product, satisfied with the purchase. This metal art piece is used outside on my patio. It has kept the rich colors through the season. Beautiful colors:) the workmanship is impressive and is such a cool design:) adds so much to our outdoor decor:) love it!!! Beautiful. Thicker metal than expected, so it doesn’t bend, keeps it shape. Colors were vibrant and absolutely beautiful. Beautiful quality and craftsmanship with vivid colors. I put a low watt sconce bulb on the wall behind it for extra drama. it looks great on my patio. .
Love the vibrant colors, I get so many compliments. Just wished it was bigger. Very well made and looks pretty. I love this piece. "How does this do outside? Does it hold up to rain? rust?" I had it mounted to one of the walls on my lanai. So it doesn't get wet. I live in South Florida where its pretty humid for 6+ months out of the year and it looks as fresh as it did when I hung it. 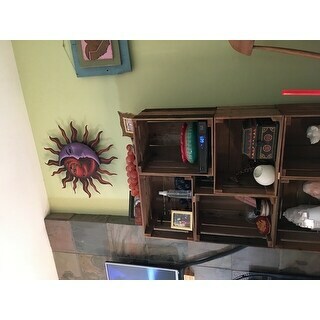 "It has been awhile since I ordered the sun and moon wall sculpture, but I do remember it taking longer to receive than most orders from Overstock, but hopefully you have it by now. You will,be pleased how nice it looks on the wall"
"how long does it take for the order to be processed? i placed my order on feb 19,2017 and to this date the status says it is still "processing""
It took 14 days to receive it. I ordered this same piece and received it four days after I placed the order. I ordered October 9th and they didn't ship until the 12th. Once shipped, it took 6 days to arrive. I received it on the 18th. Measures 23.2 inches high x 23.2 inches wide x 1.8 inches deep. "what color is the sun"
Hello azsamsi, Most reviewers agree that the right side is purple. I hope this helps you! "What shade of blue is this?" The monitor we are using shows a blue with shades of purple.